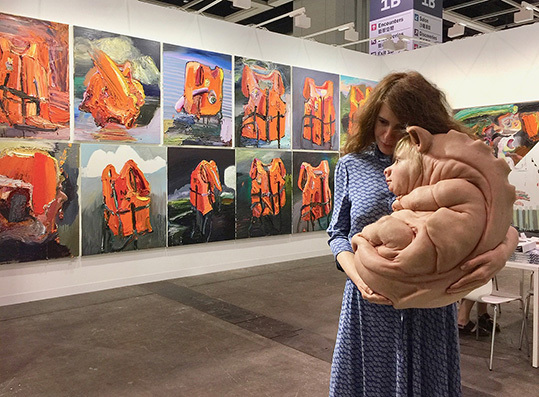 Art Basel Hong Kong, the leading art fair in the Asia-Pacific region, features 242 of the world’s most exciting modern and contemporary art galleries from 34 countries. Staged at the Hong Kong Convention and Exhibition Centre, the event’s fifth edition runs from 21-25 March and attracts seasoned collectors as well as art aficionados. Similar to its previous editions, half of the participating galleries come from Asia. This year's Encounters sector, featuring installations and sculptures of epic scale, has decidedly included artists from six new places - Pakistan, Thailand, Taiwan, Philippines, Vietnam and Tibet - emphasised curator Alexie Glass-Cantor, executive director of Artspace Sydney. The introduction of the Kabinett sector sees specially curated exhibitions within booths. 19 galleries present diverse curatorial concepts and display a wide range of works, including kinetic installations, experimental sculpture, and abstract paintings from the 60s. Several artists showing at the fair will also be participating in the 57th Venice Biennale this summer. These include Nina Canell (Norway), Xavier Veilhan (France), Tracy Moffatt (Australia), Samson Young (Hong Kong) and Erwin Wurm (Austria). Art Basel Hong Kong highlights from ArtworldNow on Vimeo.